Significance of fat-soluble vitamins A, D and E for the dairy calf. Sponsored content created and provided by Stuart Products. Due to lack of placental transfer, calves are born deficient in vitamins A and E, and depend on colostrum and milk to deliver these critically important vitamins after birth. Cows fed low vitamin levels prior to calving will produce colostrum that can be deficient in vitamins A and E. Vitamin D levels in colostrum and milk are typically very low and the calf depends on adequate sunlight for vitamin D production provided the calf gets adequate sunlight. Without proper supplementation, calf performance can be negatively impacted. University research has demonstrated the importance of adequate vitamin E for the milk-fed calf. Kansas research determined that vitamin E supplementation enhanced immunity. Iowa State University research revealed that calves fed pasteurized milk supplemented with EMCELLE® TOCOPHEROL performed better and had less scouring than non-supplemented calves. 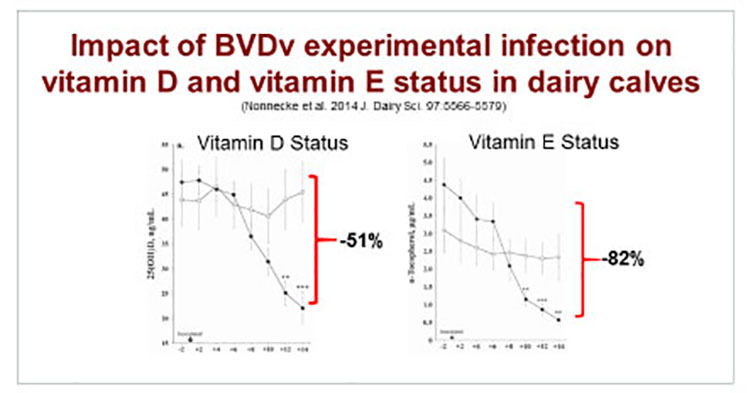 Researchers from the USDA reported that dairy calves challenged with BVDv had a significant reduction in vitamin E and vitamin D status (See Figure). To ensure that your newborn calves are sufficient in vitamins E, A, and D after birth, we recommend that immediately after birth the calf be injected with VITAL E®-Newborn for optimum levels of these vitamins during the first few weeks of life. A classical sign of vitamin E deficiency is “weak or dummy calf syndrome.” Calves that are slow to get up within two hours after birth and have poor suckling response are probably suffering from fat-soluble vitamin deficiencies. Colostrum contains eight to ten times more fat-soluble vitamins than whole milk, primarily due to its high fat content. Besides delivering necessary antibodies, colostrum delivers fat-soluble vitamins. Colostrum replacement products typically do not contain the same form of vitamin E that is found in colostrum, enforcing the need for injecting the calf that is colostrum deprived and supplement the milk with the same form of vitamin E found in colostrum. Approximately 50% of the vitamin E is lost during milk pasteurization. Milk-fed calves can benefit from EMCELLE MILKADE® a supplement that provides vitamins A, D and E, while replacer calves can benefit from EMCELLE® TOCOPHEROL. Both contain the same form of vitamin E found in colostrum. The liquid is processed to enhance vitamin absorption. Although selenium-vitamin E injectable products are good sources of selenium, they are not a good source of vitamin E. Each mL of either product contain only 68 I.U. vitamin E per mL. The level and form of vitamin E do not enhance vitamin E activity in the calf nearly as well as VITAL E-Newborn that contains 500 I.U. vitamin E per mL. This is a quick method to determine if your calves are deficient of these important vitamins. Your veterinarian can assist you in measuring your calves’ vitamin status. To learn more, visit Dairy.STUARTPRODUCTS.com or call 1-800-747-4538.